I live in Oakland, the most diverse city in America. Unfortunately, the tech workforce here does not reflect this richness of talent. The girls in my community can be part of the solution to expand and diversify the tech workforce. When I first imagined Techbridge in 1999, I wanted girls in Oakland to have the chance to pursue studies and careers in which they could inspire and be inspired by technology. I wasn't sure that they would -- not because they didn't have the potential but because they didn't have opportunities. Techbridge was designed to even the odds and empower girls to design their futures in science, technology, and engineering with support from the National Science Foundation. I'm hopeful to see U.S. policy makers now increasingly focused on this disconnect between young minority talent and the STEM career opportunities they can access, with the recognition that this issue deeply impacts our national prosperity and wellbeing. I have been invited to present Techbridge's work at the White House STEM and Career, Technical, and Adult Education Conference on Marginalized Girls this week. This conference is sponsored by a cross-section of groups committed to increasing STEM opportunities for marginalized girls--The Domestic Policy Council, the Council on Women and Girls, the Department of Education, and the Georgetown Law Center on Poverty and Inequality. I'm looking forward to seeing how Techbridge can support and capitalize on their respective work and inject effective practices into this growing movement. I am sharing on the multifaceted ways in which diversity matters in our Techbridge programs and highlighting lesson learned. 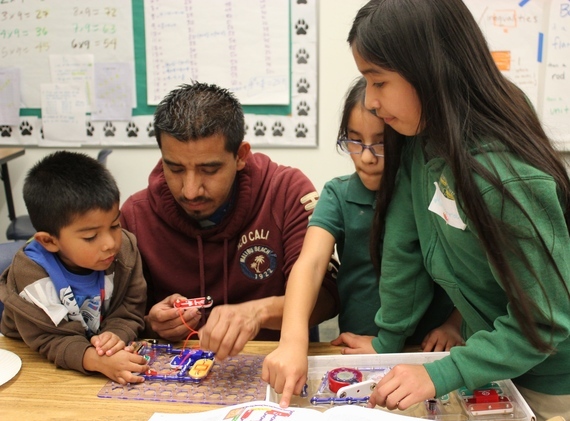 We've learned that it's not enough to make after-school STEM programs available at schools in underserved communities. We have to be strategic in whom we engage in these programs, from schools to teachers to role models. Sometimes we get it right, sometimes we don't. Like the engineering design process that we teach our girls, we learn from what goes wrong and make changes, all the while measuring our progress. I believe there is much to learn from our discussion of work in progress. Here are three lessons we are working on at Techbridge. There are science, technology, engineering, and mathematics (STEM) programs for girls. For the girls who sign up, these experiences build confidence and skills that inspire new interests and expand options. But what about the girls who hold back? I'm not smart enough. I'm bad in science. Coding sounds boring. Engineering -- isn't that for boys? I can't afford the program and even if I could, how could I get there? These are some of the reasons why a girl in Oakland or in your community might not engage in STEM outside of school. We are intentional about removing barriers that could keep a girl from participating. Techbridge hosts programs at school, right after school, and free of charge. These features make our programs accessible to more girls, but are not enough to ensure that every girl has a fair chance to attend. When I ask girls why they're in Techbridge I often hear that it is because of a teacher. We partner with classroom teachers who help us recruit a wide range of girls, especially those who could most benefit but might be least likely to participate. Some girls need someone to believe in them in order to believe in themselves. Teachers personally encourage girls to come to Techbridge -- to try just once. Oftentimes it just takes an afternoon for a girl to realize that she really does like to tinker and that Techbridge is a place where she belongs. Teachers also talk with parents and encourage them to support their daughter's participation. They can be quite persuasive and encourage parents to do whatever it takes to enroll their daughter. The teacher who has a personal relationship with a girl and her family are much more effective than we could ever be in recruiting girls who may be marginalized in school and out-of-school STEM programs. How are we doing at serving girls who are marginalized? Overall, our numbers are good. Techbridge serves many girls who are underrepresented in science, technology, and engineering. 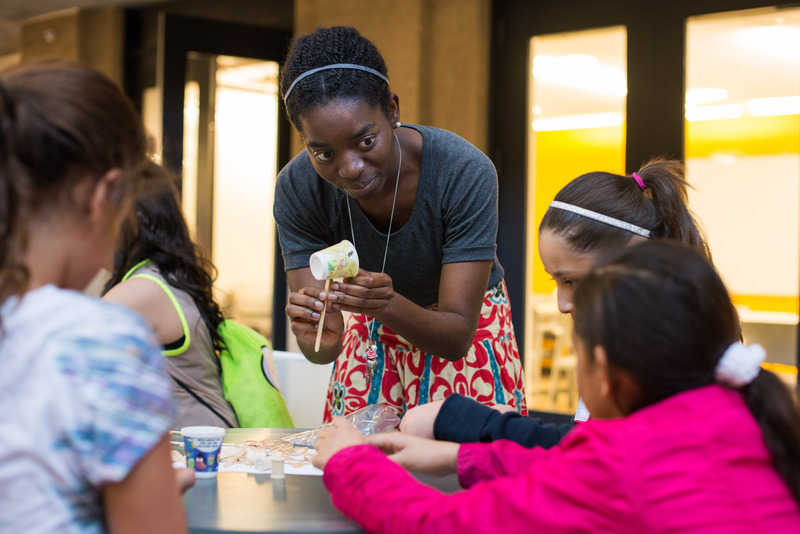 Our after-school programs have served over 5,000 girls in grades 5-12. We work with girls in under-resourced schools and marginalized communities -- girls attending Title I schools, who are first generation college-bound, and who are underrepresented in STEM. But, we could increase the number of African-American girls we serve. Currently, our numbers are not representative of the African-American population in Oakland Unified School District. We are looking at how we select schools to partner with. Some are a legacy from previous work and relationships. This year we made a commitment to make a change -- to create a pipeline of schools in Oakland with a majority of African American girls. We launched at Martin Luther King, Jr. Elementary School this week. Our plan is to create a pipeline so that these girls can continue in Techbridge in the coming years. The favorite part of my work is getting out of the office and into a program. I see girls captivated by activities that include designing video games, soldering circuits, and taking apart appliances. As appealing as these activities are, they are not enough. While girls have fun doing hands-on projects, they may think of engineering and technology as a hobby, not as a career option. Role models can help connect the dots between an activity and career interest. Our girls and role models helped us develop our "recipe for success" to make for engaging and impactful experiences. To be effective, role models need training. We help our role models learn how to share their personal story, communicate passion and "gush" about work, dispel stereotypes and talk about family and hobbies, and manage behavior when they've got a roomful of active fifth graders. We know that effective role models matter and their impact can be lasting. We also know that we run the risk of turning kids off to STEM if a role model speaks in jargon or can't share her story in a meaningful way. Our toolkit has resources for role models who are just getting started with outreach as well as those who are experienced. Where Are Role Models Who Look Like Me? When Engineering Manager, Patty Legaspi, came to Techbridge at Frick Middle School, the girls immediately connected with her. Patty shared much in common with our girls. She grew up in their neighborhood. Like some of our girls, her parents came from Mexico and because their formal education ended in elementary school, they couldn't advise Patty on the pathway to college. With the support of teachers and counselors, Patty made her way to a major in computer science and figured out how to finance her college education. She describes her rewarding career at Google as well as her strong commitment to family and community. From the number and kinds of questions they ask, we know that our girls are very much interested in what Patty has to share. We have been talking for years that we want more role models like Patty. It is challenging since women are underrepresented in STEM fields and women of color especially so. Despite this challenge, we can do better. We are working more intentionally to recruit from professional organizations like the Society of Hispanic Professional Engineers and the National Society of Black Engineers. We are enlisting help from our partners and role models to recruit more role models who reflect the backgrounds of our girls. We can't improve what we don't measure. This year we are collecting data and setting goals on the demographics of our role models. This data will help us better understand our progress and learn what's working. A father shared with me that he couldn't do much to help his daughter because he hadn't attended college and didn't speak English well. Yet he rearranged his work schedule so that he could drive his daughter to Techbridge. From that conversation I realized that we needed to do more to understand our families and better support them. We are working to empower parents and help them understand that it's their encouragement that matters -- for this father driving his daughter was really important. For others, it's inviting their daughter to share about Techbridge during dinnertime or enlisting her help on a household repair project. We learn from and with parents to better understand their needs and support their strengths. Right now we are sharing summer opportunities to lessen summer learning loss. For years, we mailed home the guide or gave it to our girls to share with their parents. Have you looked at applications for enrichment programs? They can be daunting. Imagine what the process would be like if your reading skills were limited. Last year we held sessions to help with applications and financial aid. We're asking our partners to make their application process more accessible to our girls and families. I look forward to learning about program elements and policy at the White House STEM and Career, Technical, and Adult Education Conference on Marginalized Girls. I encourage us to collectively support each other's efforts, expose our weaknesses, and share our lessons learned. This work isn't easy. Sometimes what we need to do organizationally to do better for our girls puts us in uncomfortable spaces. We often don't know what we don't know. We need help that points out our shortcomings and reminds us when we can do better at serving girls who are marginalized. I am planning to do more to understand and work with our families to best support their daughters. How will you empower the marginalized girls in your community? Inspire a girl to change the world. It's more than our tagline; it's our mission at Techbridge. Techbridge serves girls in after-school and summer programs in the San Francisco Bay Area and Greater Seattle and is launching in Washington, DC in 2015. Through partnerships, Techbridge provides training and builds the capacity of youth-serving groups to increase access and opportunities in STEM for youth. For more information about Techbridge, visit www.techbridgegirls.org. I am the CEO/Executive Director at Techbridge. My resolution for 2015 is to challenge myself and others to do more and do better at inviting girls who have been marginalized in STEM to our programs and making sure that they feel welcomed and supported.